Correction: January 17th, 2014 - Christopher Marino and Jaime Greco were charged with 13 counts of Robbery 1st Degree and two counts of Attempted Robbery 1st Degree for the robberies that occurred at 7-Eleven on January 3 and Royal Market on January 2. The number of charges for Robbery 1st Degree listed in the original release was incorrect. Medford, NY - January 16, 2014 - Suffolk County Police have arrested two people in connection with a series of armed robberies that occurred at businesses beginning December 9. Following a lengthy investigation into a pattern of robberies targeting businesses, including six at Subway restaurants, two people were identified as suspects. Detectives determined that Christopher Marino committed 15 armed robberies during which he stole cash. His girlfriend, Jamie Greco, waited in a vehicle and drove Marino away from the scene. Marino and Greco were both scheduled for arraignment today in First District Court in Central Islip. Below is a video courtesy of SCPD Official YouTube Page, showing footage of the December 9th Subway robbery. 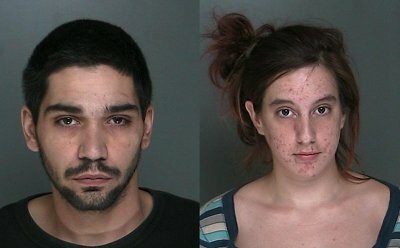 Subject: LongIsland.com - Your Name sent you Article details of "SCPD: Medford Couple Arrested for Armed Robberies"